You are here: Home / Student Life / Powder Puff Poofed? Girls start gearing up. Boys throw on your blue and gold skirts because Powder Puff is on! Despite the many rumors that have been floating around Penn Manor High School about Powder Puff, Principal Philip Gale has confirmed that the Powder Puff football game is still on. 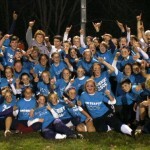 Fall of 2006 powder Puff game. “I’m almost disappointed I didn’t start that rumor,” Gale said with a smile at the controversy that came about with these rumors that were really just rumors. Many students have heard the rumors and are misinformed about the game. “I heard that it was banned because someone was drunk and knocked over the senior pyramid,” Hunter Paulson, a Penn Manor senior said. Gale indicated that there were some problems at last year’s Powder Puff game but the administration is taking precautions to prevent similar incidents at this year’s game. “Appropriate behavior, being there in the appropriate state of mind is the most important thing,” said Gale. Gale has concerns not only about the Powder Puff game but about all school activities where students may arrive in an inappropriate fashion. This year an event is to be scheduled before the Powder Puff game, similar to Penn Manor’s tailgating for football games, to ensure that students are behaving appropriately before they participate in this school-organized event. Gale explained that he doesn’t know if this is going to be a requirement to play in the game, because the actual event is still being organized. Gale is meeting with the varsity club advisors to discuss this event. Learning Support teacher Michelle Wagner, one varsity club advisor, said she also isn’t sure what they’re planning for the event before Powder Puff. Concerning the incident last year, she said that she really just wishes that students will respect all school rules if they are attending. “It’s (Powder Puff) kind of a rite of passage when you get to your junior or senior year. It’s important to carry on the tradition,” she said. The Powder Puff game has been a much-loved event by many Penn Manor students for more than thirty years, although it’s difficult to pin down the exact date it started. Social studies teacher, Joe Herman, can remember back to 1969 when his wife played in the Powder Puff football game. “It became a knockdown drag-out fight like they always are up here…but we just had fun with it,” Herman recalled. “There is not a single event that is more intense than the Powder Puff football game.” Streeter Stuart, social studies teacher and the head referee, commented about the game. The only other requirement for the Powder puff game is that the girls must attend their practices if they wish to participate in the game, according to Wagner. It is also up in the air whether the boys will be used as cheerleaders this year, but Wagner believes that they should be allowed to participate as long as they follow the school rules and respect everyone around them. However if students do not follow the school rules and show up intoxicated the police will be called, she said. As of now, the Powder Puff game does not have a set date, but members of the Varsity Club and Gale are looking at the end of November into the first two weeks of December for the event. The fall sports need to be over before Powder Puff has a set date. So all those rumors were wrong…thank goodness this reporter was on the trail of the truth! Powder Puff is something I always enjoyed. Its a chance for girls to do guys sports and prove that we can achieve the same as guys do in this sport. Abby, thank you for the article! Mr. Gale and I had a number of conversations about the issues from the game last year. We don’t want to ban the event. We are hoping that the students who will be involved this year can help improve the game so it is fun and safe for all to attend.